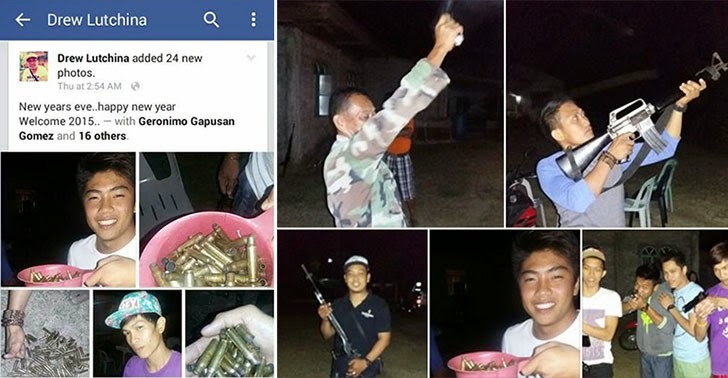 Updated January 5, 2015 8AM: Netizens on social media got furious over a video and several Facebook photos of men firing rifles and hand guns to welcome the new year. A report on INQUIRER.net identified a certain Philip Andrew Funtanilla as the person who posted the images on the social networking site at 2:54 a.m. last January 1, with a status message that read: “New years eve..happy new year…Welcome 2015.."
Bombo Radyo Philippines also reported that some concerned citizens asked for help so that the information about the incident can reach the proper authorities. The news story named the owner of the account where the controversial images were posted as Drew Lutchina, a collector of Magic Appliance Center whose address is Narvacan, Ilocos Sur. It appears that they are one and the same person. Some of the pictures show a plastic dipper (tabo) full of bullet shells and a group of men having fun while their buddies were holding a long arm and hand gun. Someone was also caught firing a .45 caliber pistol in a video. The suspects' Facebook accounts have been deactivated, but netizens were able to capture screenshots and save copies of the photos and video. Post by Major Harold Magallanes Cabunoc (Philippine Army). Post by Abu Randz Kyler. It's unclear whether or not there was a victim of the alleged indiscriminate firing. The Philippine National Police has identified the other suspects as Cezar Lutchina Funtanilla, Mark R-Jay Cabana, Jumar Cabreros, Ian Cristopher Calixterio, and Russel Funtanilla Geronimo Gomez, all of Barangay San Antonio in Narvacan, Ilocos Sur. Chief Superintendent Wilben Mayor, the PNP spokesman, said appropriate charges will be filed against them.